OnePlus recently launched their latest flagship, OnePlus 5T and as an sponsor of Comic Con India that is happening in Bengaluru, just introduced the OnePlus 5T Star Wars Limited Edition smartphone at the event. This comes after the Lava Red OnePlus 5T that was introduced in China earlier this week. The OnePlus 5T was launched in India and other countries only in Midnight Black color. The phone went on open sale in the country earlier this week. The Star Wars Limited Edition OnePlus 5T has a white colored back, Star Wars branding on the back and comes with Red colored alert slider on the left. The OnePlus 5T is priced at Rs. 32,999 for the 6GB RAM with 64GB storage version and Rs. 37,999 for the 8GB RAM with 128GB version. It is not clear if the Star Wars Edition will be available in 8GB RAM with 128GB version, just like the Lava Red version. OnePlus said that it has also unveiled a teaser video at the event. 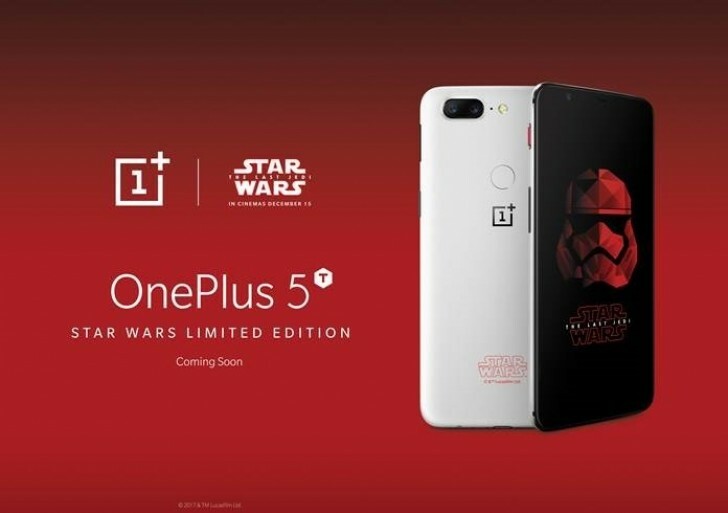 OnePlus is yet to reveal the availability for the 5T Star Wars Limited Edition, which will be announced sometime next week. We should also hear soon if the smartphone will be available all the countries the company is selling its smartphones.